Reporting from Barcelona, where Nokia has unveiled its new flagship phone for 2009, the N97. Hands-on with the N97 complete with pictures and video. Plus hands-on with the E63. 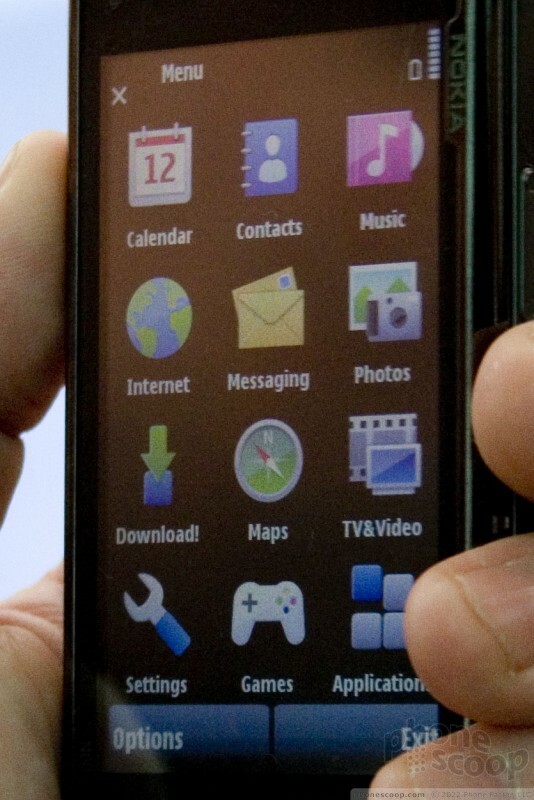 Today Nokia introduced its flagship phone for 2009, the N97. 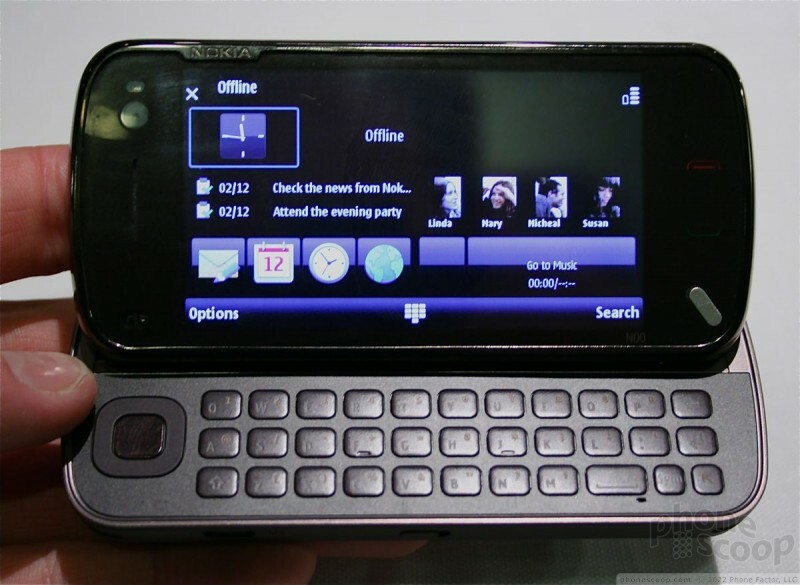 The N97 is the first N Series device to offer a full QWERTY keyboard for messaging and social networking. 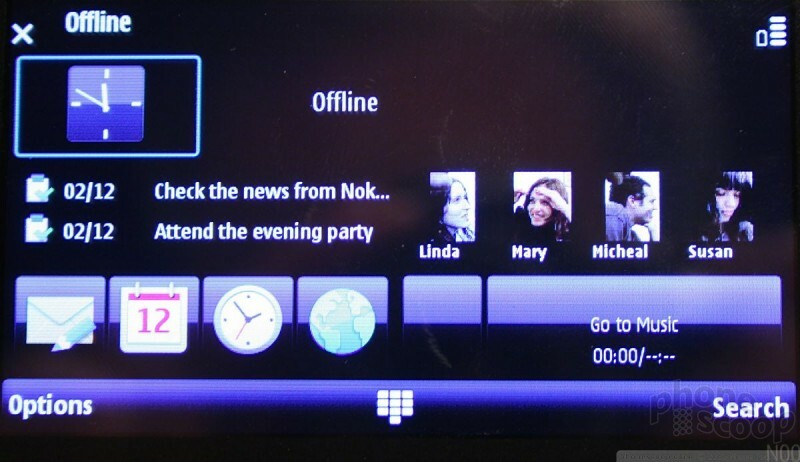 In fact, the Nokia product managers who showed us the device likened it to a "Facebook phone". In the few minutes that we were able to spend with the device, we'd call it a 5800 on steroids. 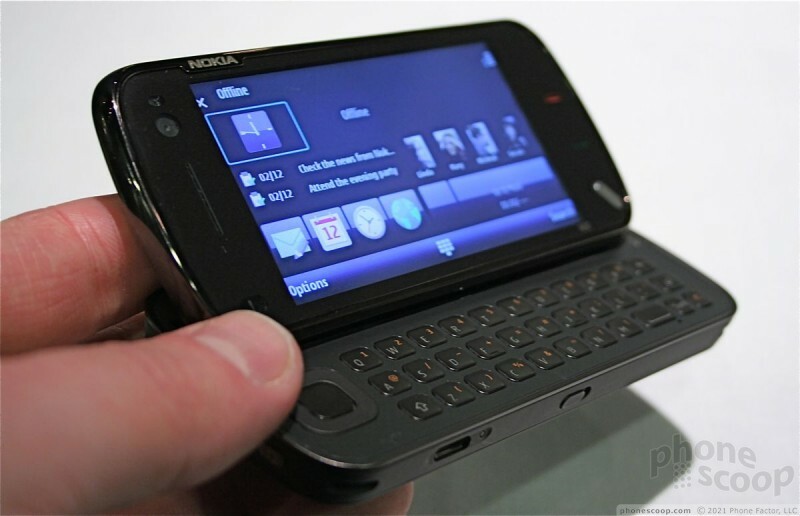 It has a resistive touch screen, as does the 5800, but has re-realized the homescreen completely based on the ideal that the N97 is for messaging and social networking fanatics. 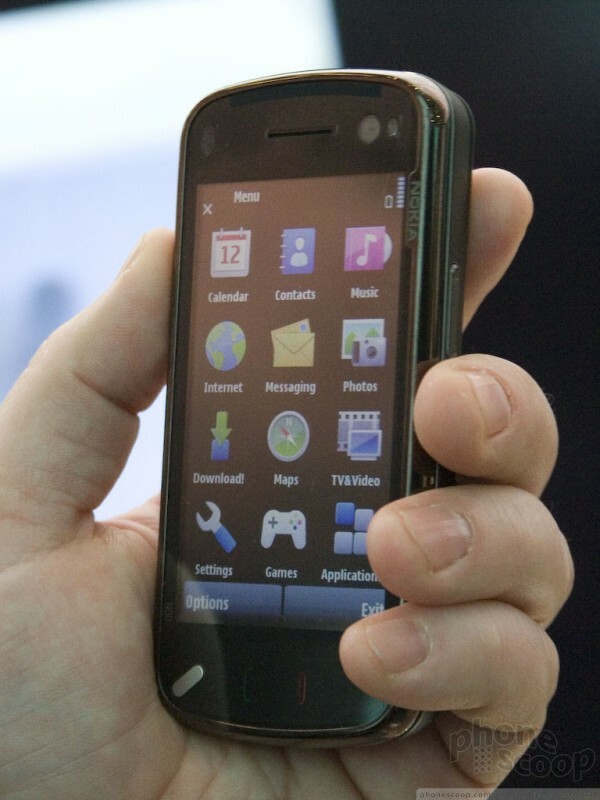 As with the 5800, it runs Symbian S60 5th Edition, with shortcuts to your four favorite contacts. The screen is a beautiful 640 x 360 pixels, and it has amazing contrast for great video playback and Web viewability. It is also fully customizable to show widgets the user wants. No longer is S60 dominated by the tiny shortcut bar running along the top of the screen. Each user can place whatever they want on the homescreen, such as a Facebook widget, calendar widget, etc. Unlike other widget home screens we've seen lately, Nokia's widgets are one fixed size, and can only be re-arranged in a small grid; they never overlap and screen real estate is always maximized. 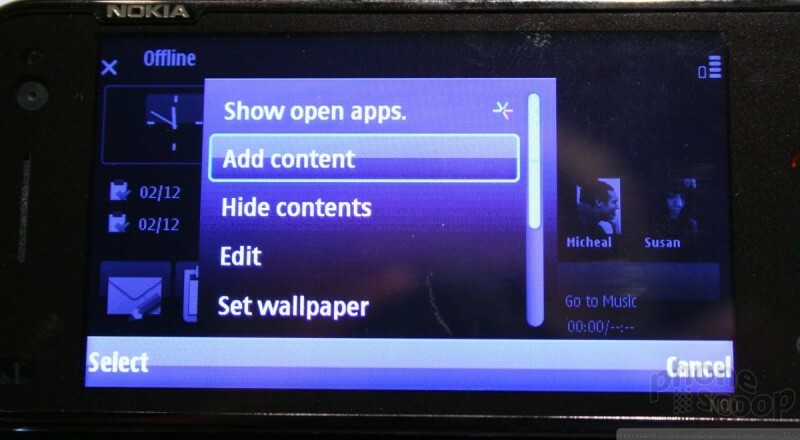 When asked what was the most innovative feature of the N97, Nokia's product managers all responded "the home screen". What we saw was very similar to the 5800, which is a decent adaptation of S60 for touch-based input. The N97 takes that adapation and evolution a bit further. 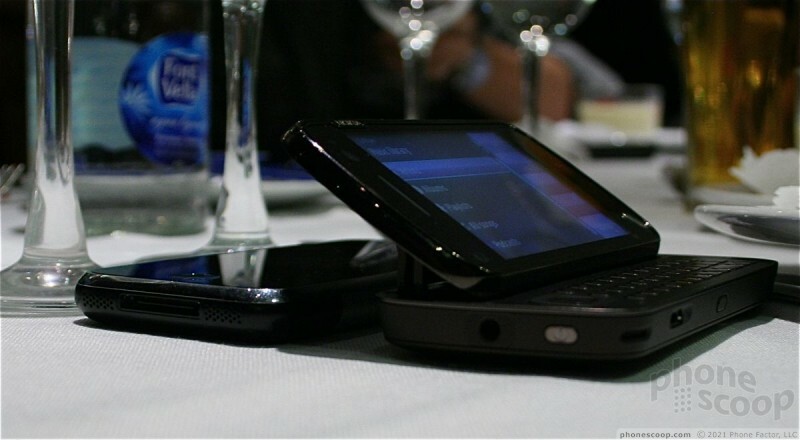 Nokia worked to reduce the number of menus and clicks it takes to get to many tasks or applications on the phone, which is a welcome upgrade for S60. 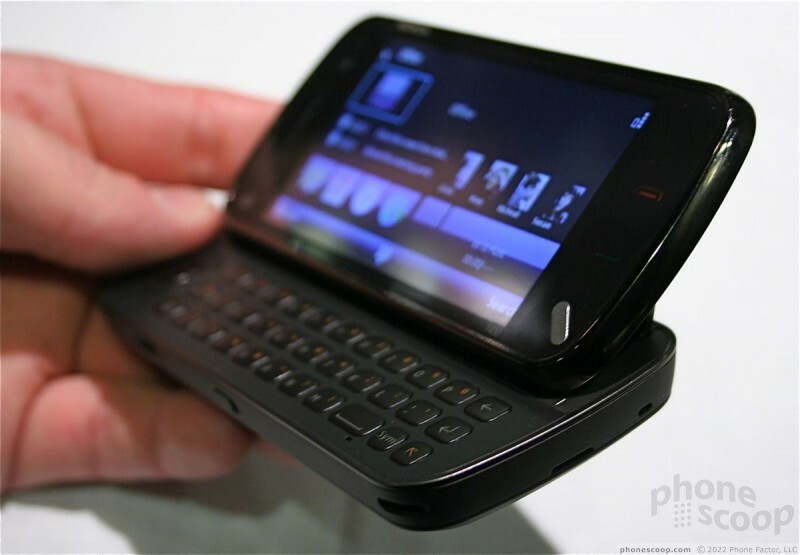 The N97 is narrower and shorter than an iPhone when it comes to length and height, but around the waist it is a bit thicker. Overall, the footprint is very nice. It rests easily in your hand, and with its rounded edges, is comfortable to hold. 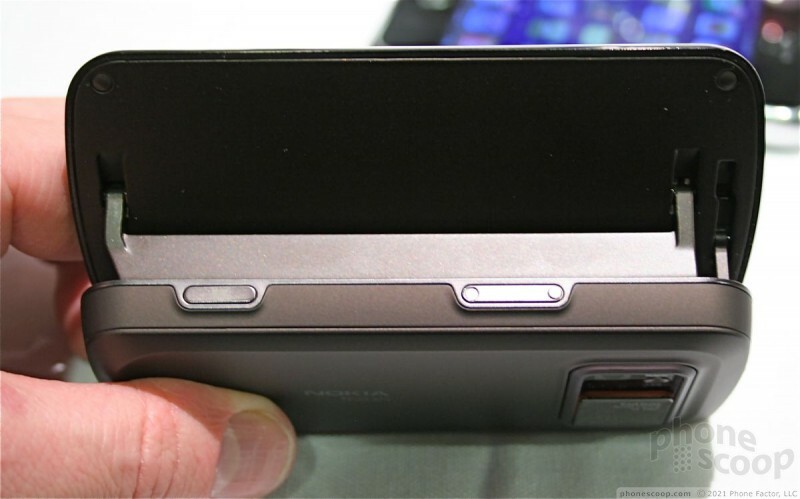 It is noticeably thinner than an N95 or N96. 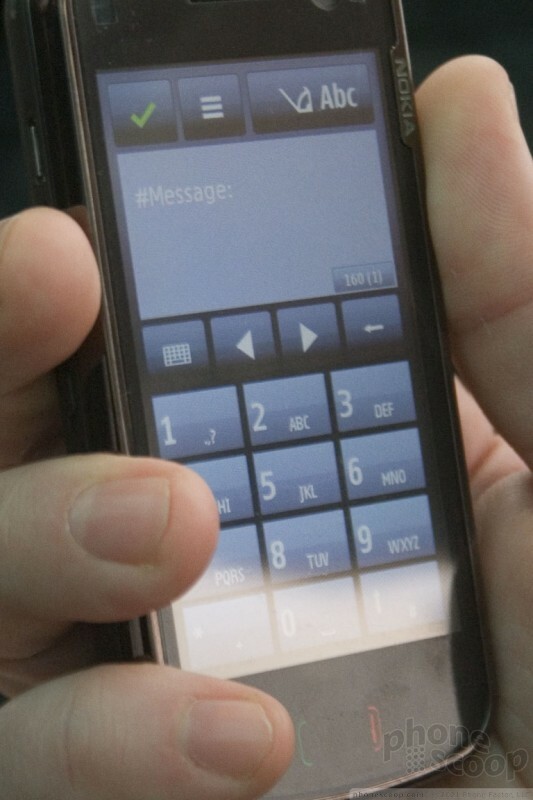 On the front of the phone, there is but one actual button in the lower lefthand corner. It activates the N Series multimedia menu. The rest of the buttons are all touch sensitive. On the pre-production units we tested, the buttons all worked well. The touchscreen itself was not that responsive, and only offered haptic feedback about 50% of the time. 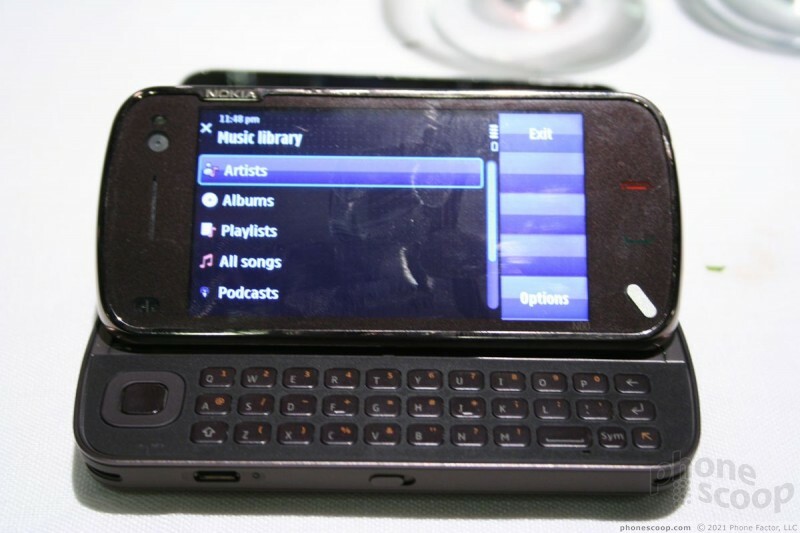 We'll chalk this up to the very early stage of development of the N97. 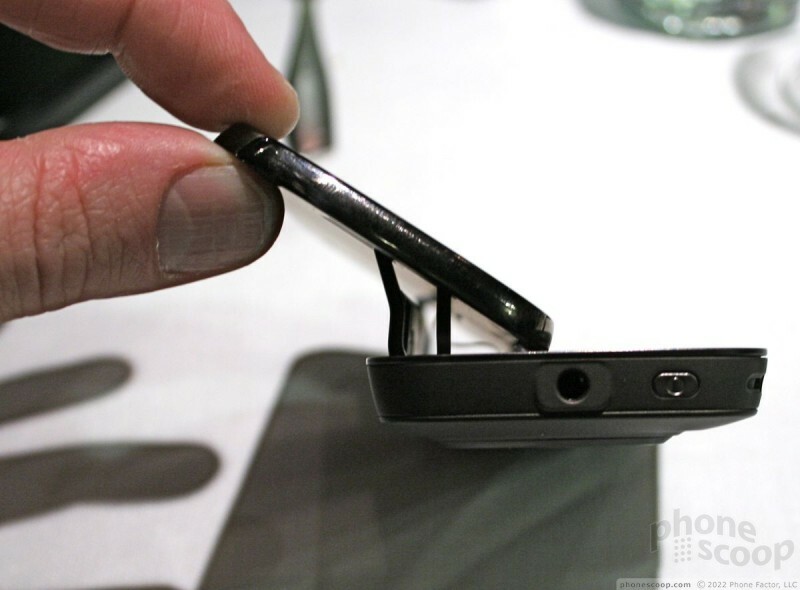 A 3.5mm headset jack (with TV out) and power button are found on the top edge of the phone. On the left is a microUSB port for charging and data transfer, as well as a sliding lock key. On the right is a volume/zoom toggle, and the camera key. The battery, SIM and microSD are only accessible with the back panel removed. The sliding mechanism to raise the top half of the phone and reveal the QWERTY keyboard felt very good for an early prototype phone. It was solid, and had no side-to-side play at all. It is no doubt the strangest hinge we have encountered, but it worked well. The top half slides up just enough to show the full keyboard, and is very well balanced. 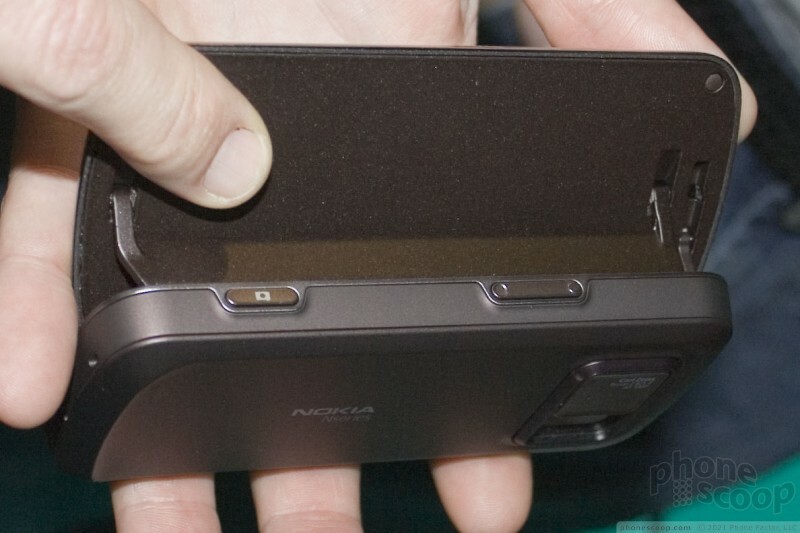 Setting the N97 on a table with the slider open, for example, the phone rests perfectly and does not tip over. It was a bit stiff, but otherwise we were impressed with the sliding mechanism. The keyboard offers three rows of keys, as well as a D-pad on the left side of the device. 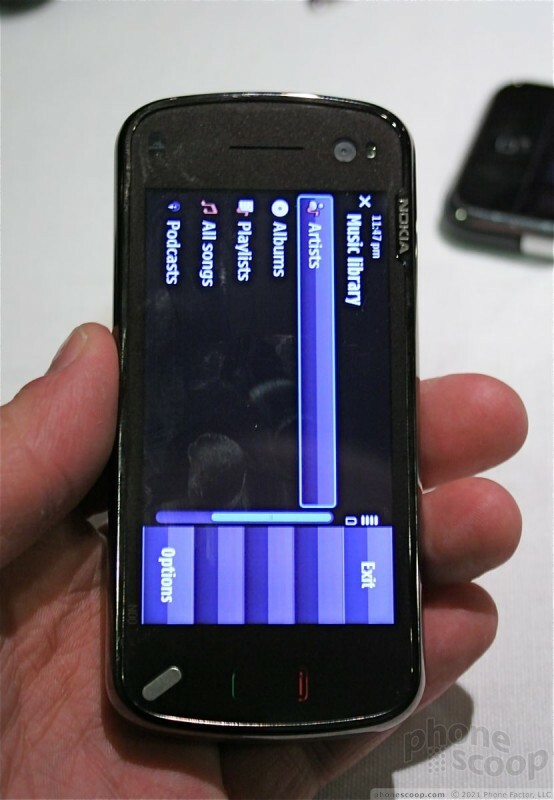 The D-pad felt fine for navigating the N97's menus, but the touch screen was often faster for selecting items on the screen. The QWERTY keyboard itself felt good. Not super impressive, but better than other full QWERTY keyboards we've played with lately (such as the HTC G1 and the Pantech Duo 2). It is definitely a better keyboard (in a tactile sense, anyway) than that of the E90. The keys had good travel and feedback, and you could definitely tell when you pressed them. Spacing was also good, and it didn't feel like your thumbs had to travel too far to reach the keys. 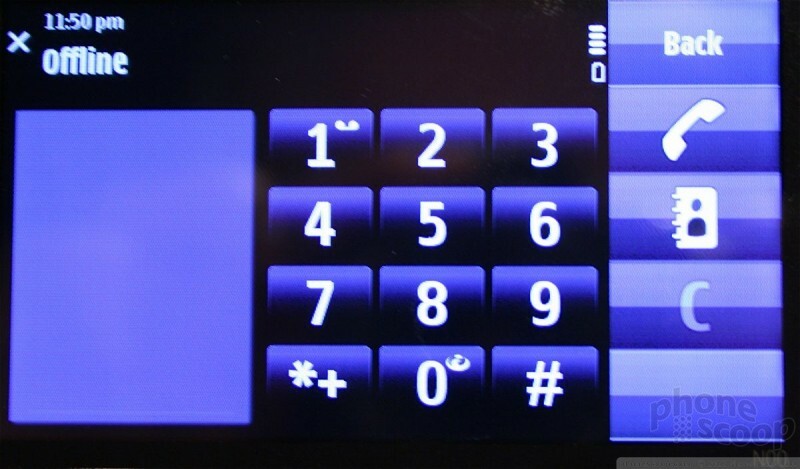 Virtual keyboards are also available, including a numeric keypad with T9 for one-handed operation. 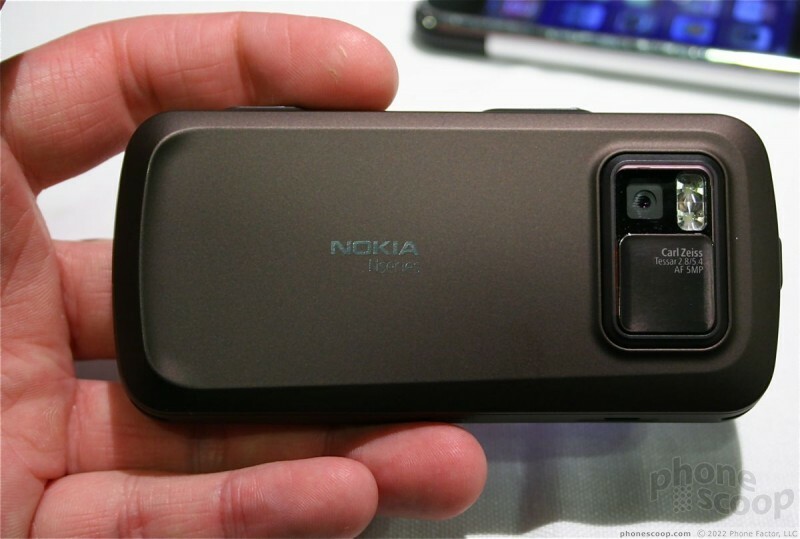 On the back of the phone, you'll find the now-familiar 5 megapixel camera with Carl Zeiss optics and flash. 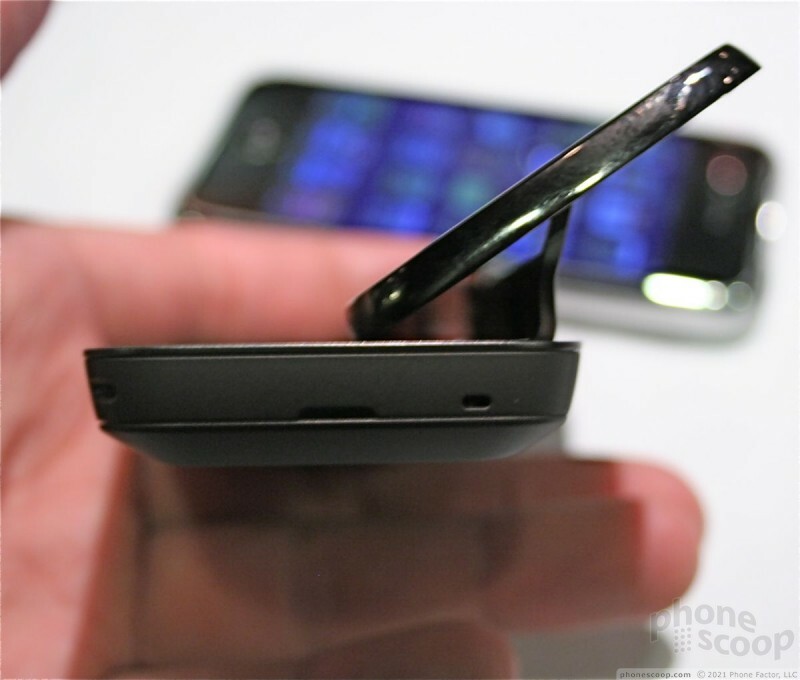 There is a sliding hatch covering the camera lens to protect it. Slide it open to launch the camera. In all, the N97 is impressive. We'll reserve final judgment for when we see final builds of the device. Nokia has slated the N97 for a launch in the first half of 2009, so it has plenty of time to work on the device before it hits any world markets. For messaging fanatics who also want a good camera, GPS, Wi-Fi, FM radio, Bluetooth, a touch screen and many other features, the N97 will be a solid contender in the touch-phone market.